Aging is associated with significant changes in the immune system, a phenomenon called immunosenescence, which has been implicated in the increased morbidity of, and mortality from, infection in the elderly. While many immune functions are affected by aging, the defects in T cells are the most pronounced and best characterized. Nutritional intervention has been proposed to be helpful in delaying or reversing immunosenescence, which is well exemplified in the case of vitamin E. Studies in several species of animals show that vitamin E deficiency impairs immune function, which can be corrected by vitamin E repletion. Although vitamin E deficiency is rare in humans, increased intake above recommended levels has been shown to enhance T cell function, particularly in aged animals and humans. The mechanisms for this effect of vitamin E involve both a direct effect of enhancing T cell activation and effector function and a suppressing effect on production of prostaglandin E2, a T cell-suppressing lipid mediator known to increase with aging. 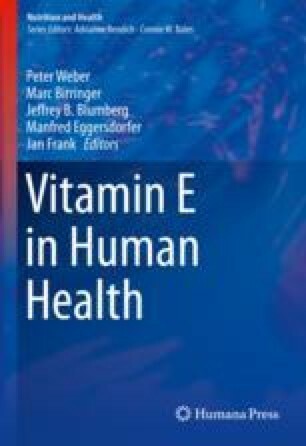 Vitamin E-induced enhancement of immune functions has significant clinical implications as evidenced by the findings that vitamin E supplementation is associated with increased resistance to respiratory infections in both aged mice and older adults. In this chapter, we review age-related changes in the immune system, evidence for an immunomodulating effect of vitamin E, the underlying mechanisms, and its clinical application in protecting the host against infection in both animal models and humans. The authors’ work is supported by the USDA/ARS under contract #58-1950-4-003 and various grants from NIA.